Welcome to your new favourite potatoes! This potato bake with bacon is a perfect ‘posh’ side to serve with any kind of meat. 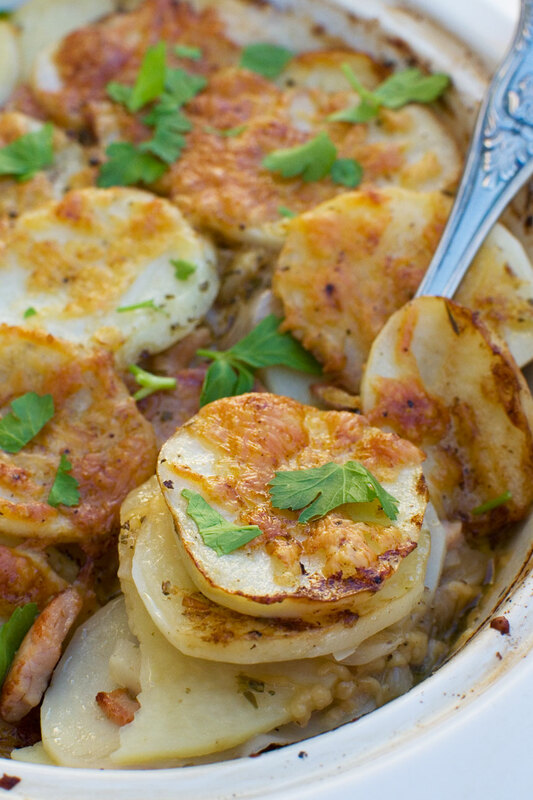 Lighter than a creamy potato gratin, but just as delicious and easy to make! You can never have too many potato side dish recipes up your sleeve! Especially during the winter and party season, but really for any time of year. The French have been making this potato bake for hundreds of years. And of course the French know a thing or two about delicious food. Way back when, people used to take their potato dishes to the local bakery to be cooked after the bakers had done baking their bread. Hence the name: boulangere potatoes, or baker’s potatoes. OK, nice story… but what ARE boulangere potatoes? Boulangere potatoes are a little like a potato gratin, or dauphinoise potatoes, which I also love. BUT with one main difference. But before you click away, no cream doesn’t mean any less delicious. Note that normally boulangere potatoes don’t contain any bacon or parmesan. 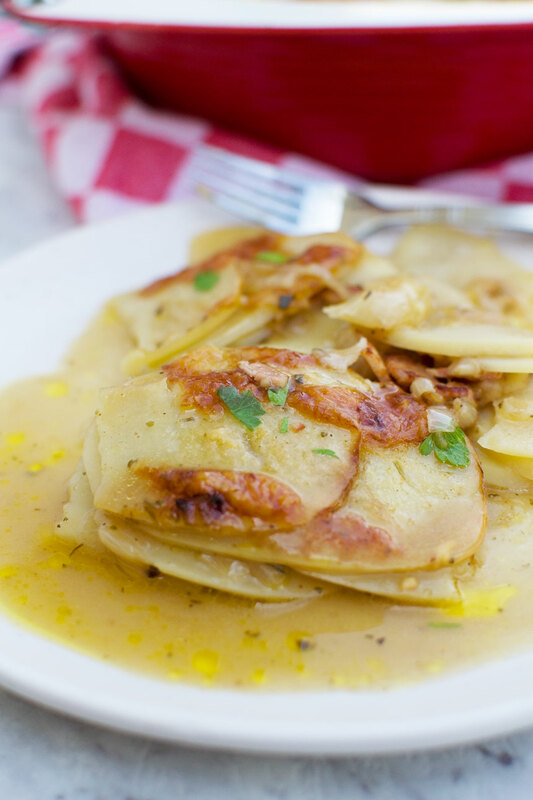 Feel free to skip the bacon and parm and you’ll still have a mighty tasty dish of potatoes! So how do you make boulangere potatoes? And how come they’re so ridiculously tasty? The first thing you do is pan fry some delicious bacon pieces, so… BACON! 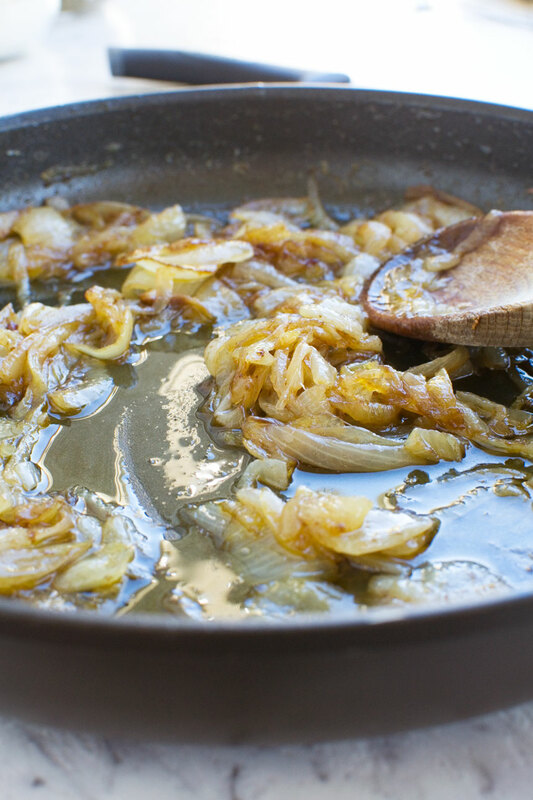 Then you use the same pan to CARAMELISE 2 whole onions in butter. I’ll leave you to imagine the flavour infusion! As you layer up your potato casserole, you scatter over salty, tangy,delicious PARMESAN CHEESE. You also scatter mixed HERBS AND BLACK PEPPER between the layers. Your potato bake gets an irrestible CRISPY, CHEESY top. 1. 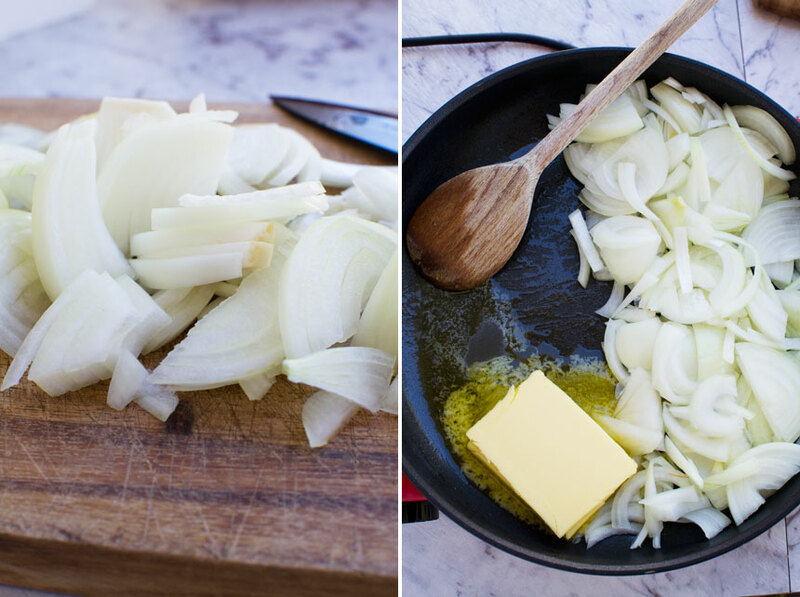 Slice your onions and caramelise in butter. 2. Let cook for 20 minutes or so, then add a splash of balsamic vinegar! 3. Layer up your potato bake like a lasagna. 4. Finish with a final layer of potatoes and parmesan, then dot with a bit more butter. Pour over your hot stock, and BAKE! So are boulangere potatoes healthy? I wouldn’t dare to say these are healthy potatoes (hello butter, bacon and parmesan), but they’re certainly lighter than dauphinoise potatoes or any kind of creamy scalloped potato dish. Maybe you don’t always want cream with your meat and potatoes! I usually use my food processor to slice the potatoes (I have this food processor and I love it! – affiliate link). You get an even thickness that way, and it takes literally about 10 seconds to slice them all. A mandolin works well too. In the video I actually sliced my potatoes by hand, just to show you that you can. It’s still pretty easy this way, it’s just that it takes a bit longer and it’s harder to get the slices the right thickness. But please don’t worry if you don’t have a food processor or mandolin. The recipe will still work if the potato slices aren’t all exactly the same! Another little tip which always helps me to make this. 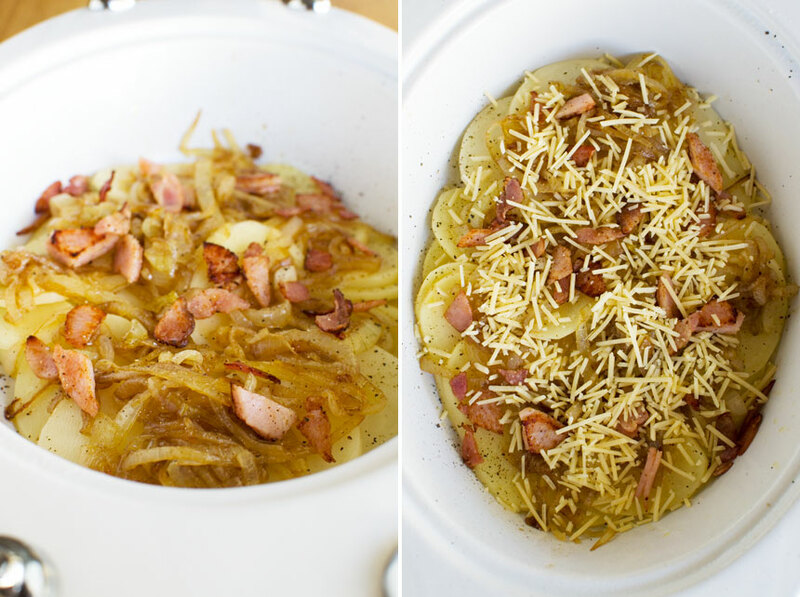 It may sound obvious, but before I start layering up my casserole, I always roughly divide the potatoes and cheese into 4, and the bacon bits and onions into 3. This way you don’t have to worry about getting a bit too enthusiastic with your first layer of bacon and onions! DO NOT wash your peeled potatoes, or soak them in water. This would wash away some of the starch in your potatoes. You need this starch to work its magic in the oven and slightly thicken up the juice! I usually serve this potato bake with bacon with a supermarket rotisserie chicken. 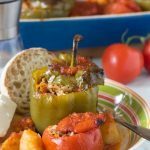 The combination makes for the perfect effortless meal – but it actually looks like you have made some effort, if you know what I mean! 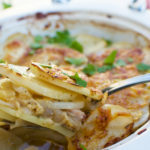 If you aren’t ready to eat your chicken just after you’ve bought it, or it’s a warmer day, you can even pop it into the fridge and serve it cold with this delicious and comforting potato bake. I love the combination of the cold meat with the piping hot crispy cheesy potatoes! But can I serve this potato bake to guests? I sometimes make this for our family midweek. There are two and a half of us if you count our toddler. Which of course we do, although how much he’s going to eat on any one day is anyone’s guess! 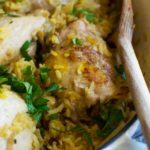 Our chicken with potato bake lasts us 2 nights and possibly even a couple of lunches too. These boulangere potatoes are French, remember. So of course this potato bake with bacon is posh enough to serve to guests. 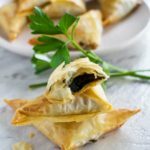 It can very easily serve 6 as a side dish to go with any kind of meat and vegetables you can think of. 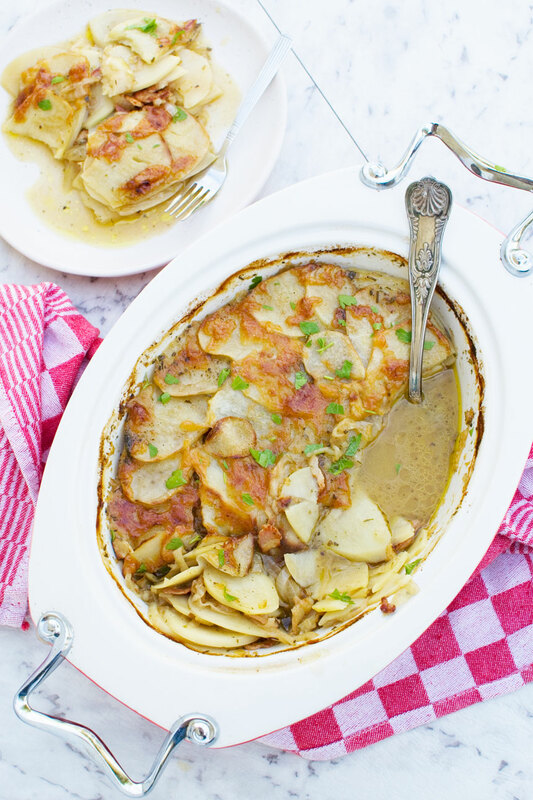 This potato bake would be absolutely perfect as a Thanksgiving or Christmas side dish! Can I prepare boulangere potatoes in advance? Yes, you most definitely can. Instructions for making ahead and storing in the fridge or freezing in the recipe notes below! The juice is so delicious. These potatoes are perfect as a side dish with any kind of meat. These Greek potatoes are the best Greek potatoes you can imagine. 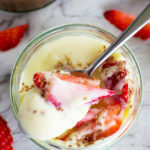 Crispy, creamy and completely delicious! If you really want to impress your guests, you won’t go far wrong with these mini garlic and parmesan hasselback potatoes. If you make any of these potato recipes, don’t forget to take a picture and post them on Instagram, tagging them #scrummylane. I can’t wait to see your creations! This Breville food processor is easy to use, and it has a great attachment for slicing the potatoes to exactly the thickness you want. You can also make french fries with one of the other attachments! You need a baking dish about this size (12 x 9 inch) for this recipe. The dimensions of your dish don’t need to be exact though. I used a medium sized oval shaped dish with roughly similar dimensions and it was fine. Super tasty, crispy, cheesy bacon-y potatoes. 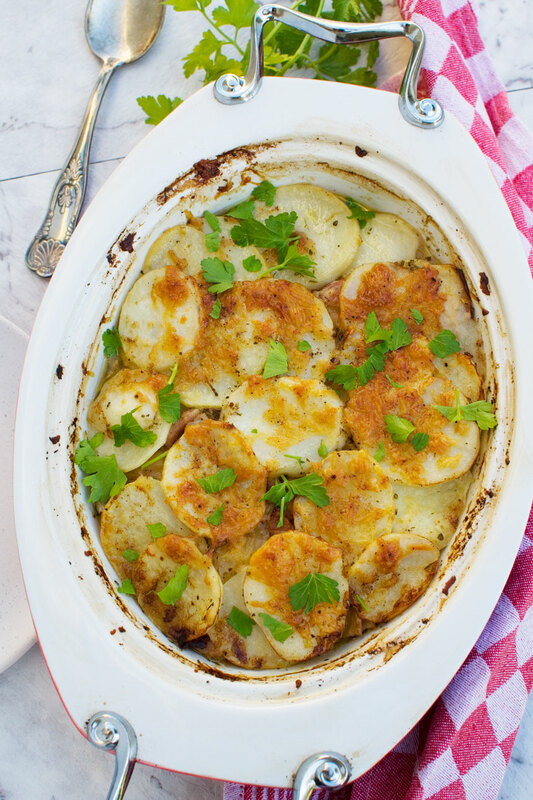 This potato bake with bacon, otherwise known as boulangere potatoes, is the perfect ‘posh’ side for serving with your meat and vegetables main. 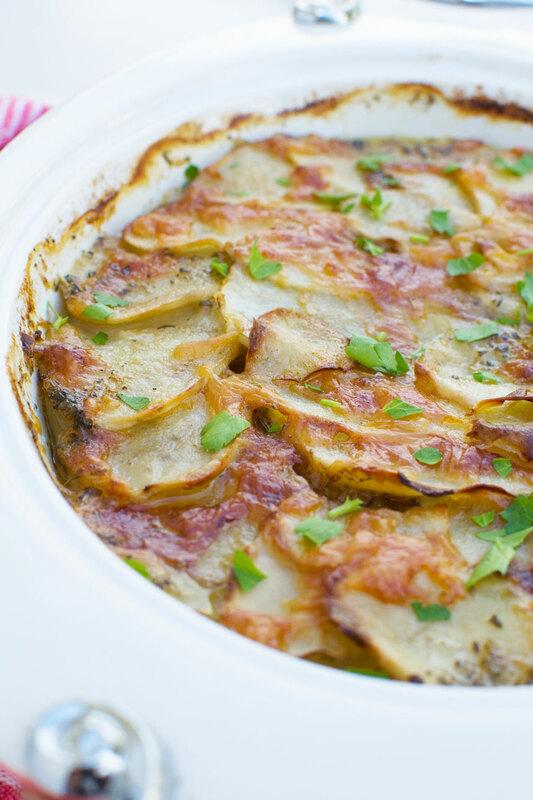 You’ll find them a little lighter than a typical creamy potato gratin, but they’re just as delicious and easy to make! Pan fry the bacon in a little oil for about ten minutes or until starting to brown/crisp. Remove the bacon from the pan with a slotted spoon, leaving any pan juices behind. Meanwhile, slice your potatoes thinly (about 3 to 4mm thick). I use a food processor to get even slices, but this isn’t essential. Now slowly cook the onions in the butter in same pan you cooked the bacon in until they start to go golden and sticky (about 15 to 20 minutes). Stir from time to time (but not too much). Just before the end of the cooking time, add a splash of balsamic vinegar and let cook for a minute or two more. While waiting for the oven to heat up, layer up your potato bake like a lasagna. Spray your baking dish with oil (a medium sized dish - I used the equivalent of a 12 x 9 inch dish). Cover the bottom of the dish with about ¼ of the potato slices. Sprinkle with 1/3 of the onions, 1/3 of the bacon, and ¼ of the parmesan. Sprinkle over a large pinch of herbs, and plenty of black pepper. 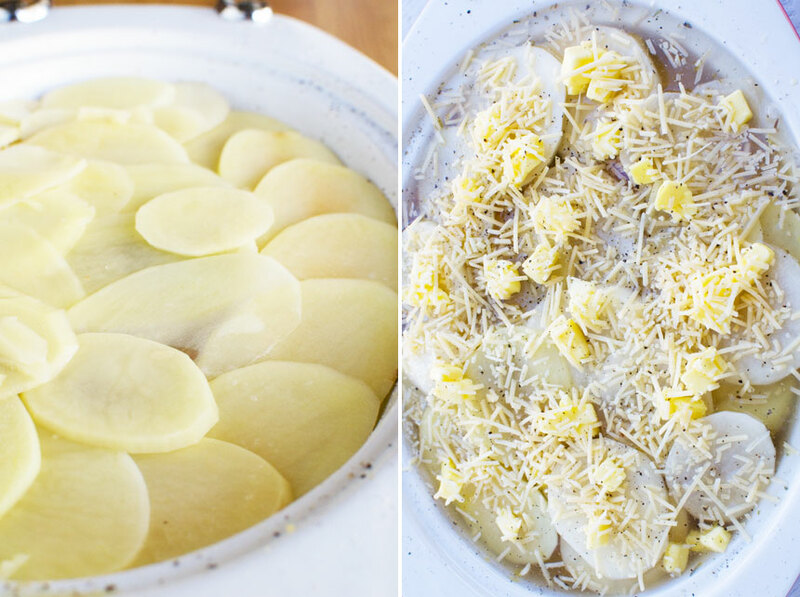 Continue layering until you have a fourth and final layer of potatoes on the top of your casserole. Press the potatoes down with your fingers, then sprinkle with the final ¼ of the parmesan. Place the dish on a baking sheet, then carefully pour over the broth/stock until it barely covers the potatoes. Dot the top of the potato bake all over with butter, then bake for 1 hour to 1 hour and a quarter or until your potato bake is nicely browned on top and bubbling, most of the broth/stock has been absorbed, and the potatoes are tender. Let stand for 20 minutes to let more of the broth/stock be absorbed. Sprinkle with a little chopped fresh parsley if you like before serving. DO NOT wash or soak your potatoes after peeling. This will wash all the starch away, which is essential for thickening up the juices in your potato casserole. You may find the results vary a little according to which type of potatoes you use in your potato bake. The best potatoes to use are really starchy ones that will thicken up the juices as the casserole bakes, but sometimes it’s hard to know which kind of potatoes are starchier! If you don’t know, don’t worry. You may end up with slightly runnier ‘juice’ in your casserole, but that’s OK. These potatoes will still be absolutely delicious! This potato bake can be made ahead and refrigerated and/or frozen until you want to eat it. Make and cool completely, then either store in the fridge for a day or two or wrap well and freeze. When you want to serve your potatoes, simply defrost completely (if frozen!) and reheat for 30 minutes at 355F/200C. This is a very smart recipe, especially the important detail not to wash the potatoes! Great instructions and creativity. Thank you so much, Beth! I really appreciate the compliment, and so glad you like the post! This is a lovely side dish that would be a great pairing with any protein!